Congratulations to Fiona Baker-Milligan on regaining the Susan Jenness Trophy she last held in 2011. 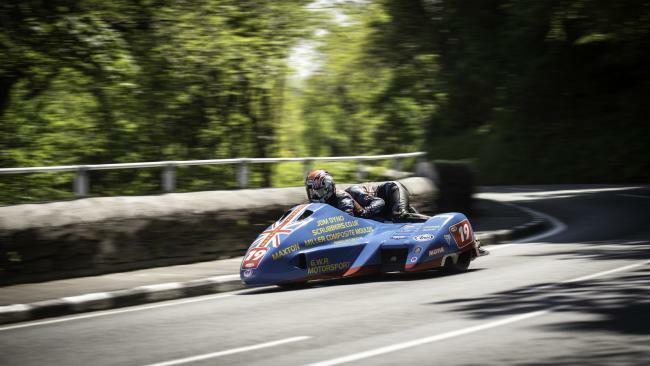 At the 2015 TT Races, as partner to her dad, Tony, she took home two Bronze Replicas for finishing 11th and 10th in Sidecar Races 1 and 2 respectively, but more to the point, lap two in the former, was completed at a speed of 109.321mph, the fastest ever by a female sidecar passenger. Taking this honour from Sally Wilson, she is the worthy winner of the trophy presented annually in memory of Susan Jenness who tragically lost her life some years ago whilst marshalling an off-road motorcycle event in the UK. The trophy is awarded in recognition of the most meritorious performance by a female competitor as adjudged by the Executive Committee of the TT Supporter’s Club. Coincidentally, Fiona was 11th in both races when she last held the trophy, which she was also awarded in 2005. It was a double celebration for the family crew as Tony was this year’s recipient of the Frank Cope Trophy awarded for the most meritorious performance with respect to the competitor’s age. Tony’s sidecar TT career began in 1985, having competed in one MGP meeting, 1972, as a solo competitor. Fiona will be presented with the Susan Jenness Trophy at the next TT. Alan Bonner, Ivan Lintin, George Spence, Matthew Rees, Roy Tansley, Craig Neve, the Siro family sidecar team, 1966 Seamen’s Strike. Father and daughter in action at Laurel Bank. The Susan Jenness Trophy awaits Fiona. Two award winners captured by Mike Hammonds in one photo. along with dad Tony who received the Frank Cope Trophy for the competitor adjudged to have made the best performance with respect to his age.